Would you know how to change a wheel bearing? Would you know how to bleed your brakes? Would you know how to change your brake pads? These, plus many other essential maintenance hints and tips are covered in our informative and fun Carriage Maintenance Class. 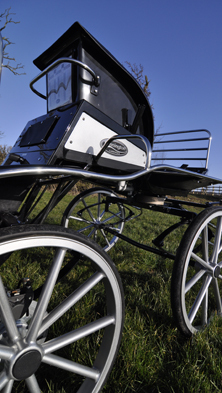 Given by our experts - the skilled craftsmen that actually made your Bennington Carriage - the class is the perfect way to gain the knowledge to keep your Bennington safe and ready for pleasure or competitive use. Each Carriage Maintenance Class is approximately 4 hours long and includes a buffet lunch, tea / coffee & cake Reception, goodie bag and factory tour. The class cost is £80 per person. "Bennington Carriage Maintenance course has given us so much info and hands on experience"
"A really great day! Learnt so much and such fun doing it"
"Very informative and a great opportunity to meet others involved in carriage driving"
"This was a brilliant course, Simon took time to explain to non-mechanically minded attendees the intricacies of the brake system, bearings and oil seals"